life. Here he matured in his art and created his greatest works, most notably the violins that set the standard for perfection in the music world. In the 1680s he continued to develop his own style, moving away from Amati's design to create a more solid-looking violin made of new materials and finishes. The resulting instruments during this time created a more powerful sound than earlier violins, and musicians from outside Cremona began to seek out instruments from his workshop as his fame grew. 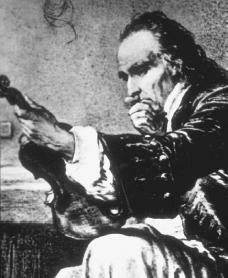 Upon Amati's death in 1684, Stradivari was considered the city's greatest violin maker.